“When are you going to blog about our Mother’s Day dinner?” inquired my mom last weekend while I was visiting family in San Diego. “Soon, my dear,” I assured her. Well, it’s been a month and a week since The Astronomer and I treated Mom to a belated Mother’s Day celebration at Hatfield’s, but fortunately the memories from our dinner are still fresh in my mind. Good meals have a way of sticking around the old noggin. It’s those mediocre ones that are soon forgotten. A table fit for four, located near the open kitchen as requested, was set and ready when we arrived for our 8 PM reservation. It had been about a year since I last visited the restaurant, and I’d forgotten how lovely the space and ambiance were. 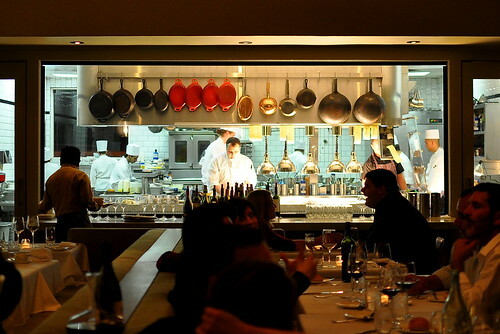 Nearly every seat in the house has a great view of the kitchen, the acoustics are perfect for conversation, and the lighting is moody but not overly so. This is the kind of dining room that a mother would appreciate on her big day. 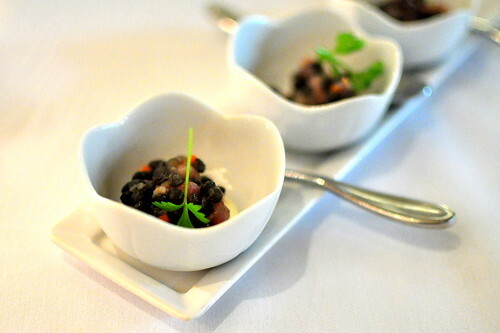 Three dishes filled with beluga lentils, yellowfin tuna, and Meyer lemon creme friache were brought to the table soon after we placed our orders. The ingredients meshed well together, providing a fresh and bright start to our meal. 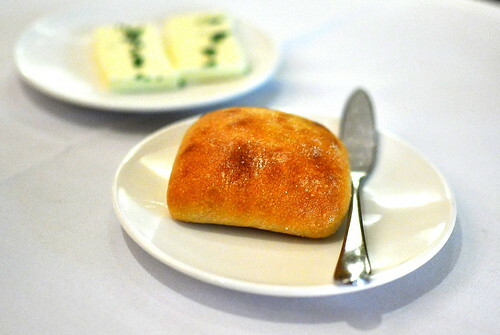 The bread service at Hatfield’s is simple and delectable. The roll, which arrived finger-searingly-hot, was crusty on the outside and soft and pliable on the inside. Served along with it were two generous pats of butter sprinkled with chives and coarse salt. I’ve admired the bread and butter here ever since I first visited two years ago at the bungalow on Beverly. 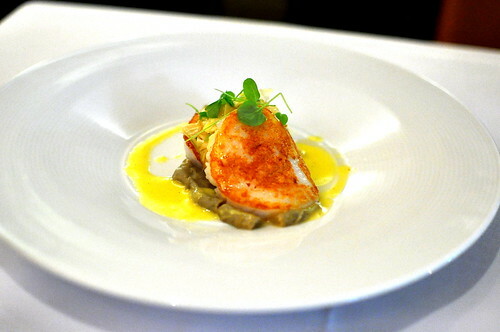 The Astronomer and Mom both ordered the seasonal prix fixe, which was priced at $59 for four courses. There were two choices for each course, and they ordered one of each in order to sample the entire menu. Mom’s first course was the raw marinated hiramasa with Anaheim chile, endive, Meyer lemon crème fraiche, and crispy shallot. 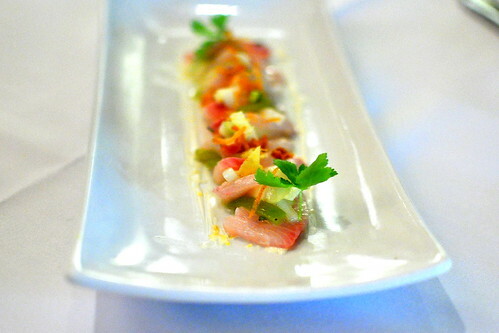 She loves raw fish preparations almost as much as I do, so this starter was definitely pleasing to her palate. 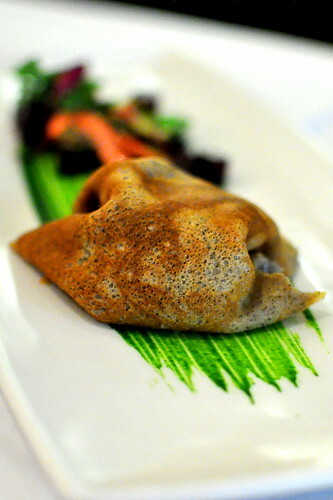 The Astronomer’s first course was a crab-filled buckwheat crepe. Pickled beets, marinated radish, and herbs garnished the side of the plate. The crab filling was plentiful and creamy, while the crepe had a nutty quality that tempered the crab’s richness. Next came the seafood courses. 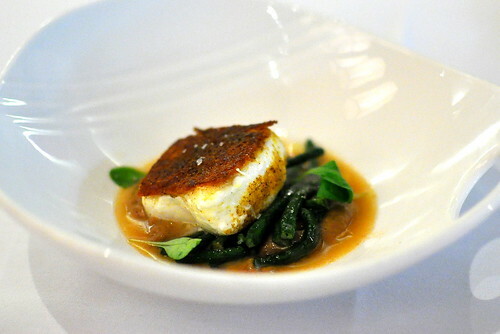 Mom requested the halibut with curry toast crust, which was perched atop a mound of soy long beans and an eggplant purée. The fish was cooked well, but the curry flavor wasn’t as pronounced as I had hoped for. Mom really dug the beans and puree. The Astronomer’s seared diver scallop with vanilla saffron sauce and marinated artichoke tasted good, but the scallop was a bit strange. It seemed to us that it was sliced in half, which resulted in a thin and wimpy presentation. One plump and juicy scallop would’ve been better than two flaccid halves. Moving on to the meat courses, Mom received the braised pork belly with fingerling potatoes, blue lake beans, and harissa. I wasn’t sure whether or not the pork would be tender based on its pale appearance, but I needn’t have worried because it was most definitely well prepared. 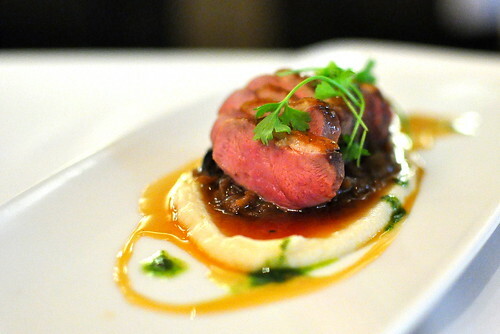 The Astronomer was also very happy with his pan roasted duck breast with caramelized endive and cherries, pistachio pistou, and celery root puree. He shared a slice with me, along with a cherry, and I found it to be a very appealing combination. 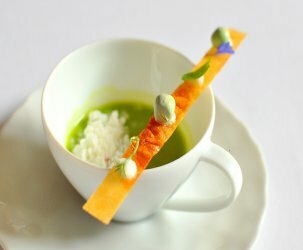 While my two dining companions embarked on a tasting menu, I opted to order a la carte. 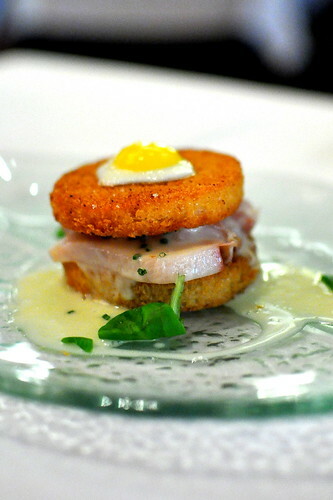 Chef Quinn Hatfield’s signature “Croque Madame” ($18) is one of my all-time favorite dishes, and I was thrilled to be reunited with it. 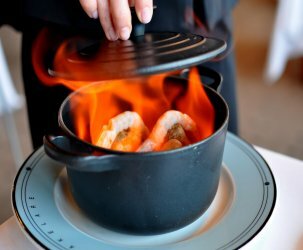 For the uninitiated, Hatfield’s Croque is comprised of pristine slices of yellowtail sashimi and prosciutto smothered between two buttery rounds of grilled brioche. To top it all off, a sunny side up quail egg. 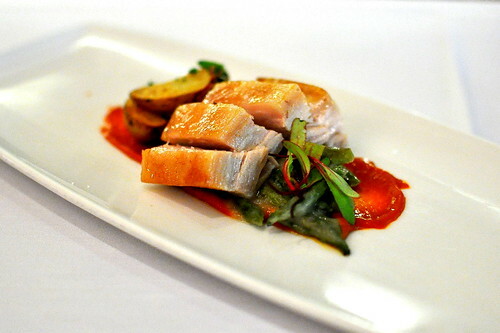 It’s a beautifully balanced creation, complete with contrasting temperatures and textures. 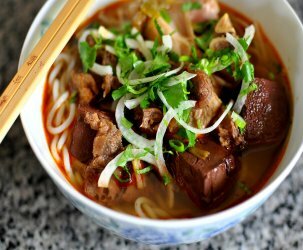 I could eat this dish daily and never grow tired of it. 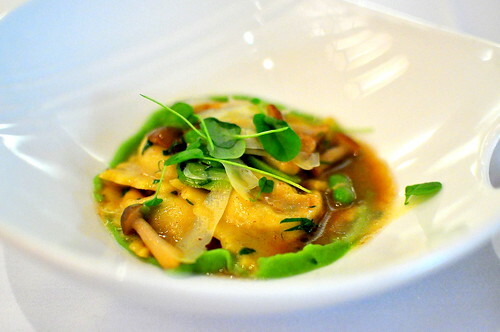 I also ordered the Berkshire pork ravioli with fava beans and hon shimeji mushrooms in Sherry brown butter ($15). I liked this dish at first, but it grew overwhelmingly rich toward the second and third ravioli. Fatty pork bathing in a rich butter sauce might be too much of a good thing. Luckily, Mom and Husband were happy to alleviate my suffering. To finish, we chose two desserts from Karen Hatfield’s standout lineup of sweets. 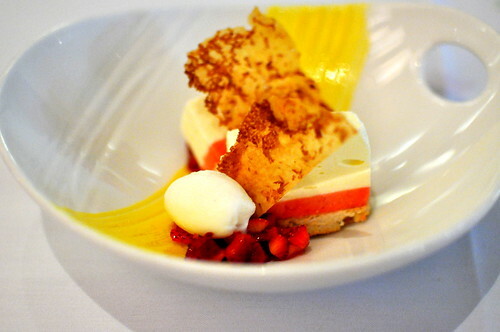 The coconut strawberry semifreddo with coconut dacquoise, marinated strawberries, and toasted coconut wafer was just sweet enough and superbly refreshing after such a savory feast. 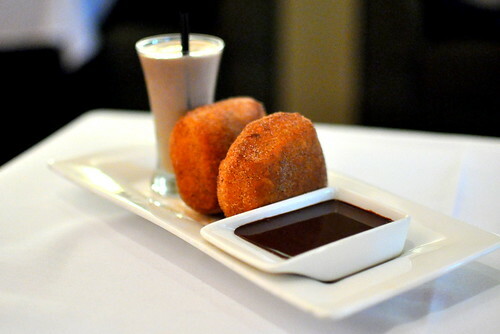 The Astronomer couldn’t resist ordering his old favorite, the sugar and spice beignets with Venezuelan chocolate fondue and a shot of Mexican chocolate milkshake. While a fruity pairing would’ve been nice, The Astronomer enjoyed these as much as he has in the past. And last but not least, three dense chocolate and espresso brownies that no one managed to finish because we were so incredibly stuffed. Wow! Pretty amazing dining experience. Mmmm mmm! I have never made it to Hatfields but I hope so one day when I return. I want that buckwheat crab crepe! What a lucky mom to have a daughter and son in law like you guys! Ut – There will be a mom and daughter shot in my next post 😉 Hang tight! did i just read that correctly? “for the unitiated…” that’s like KFP pulling a Kevin Eats with the photo of the bill 😛 lol. I like the flexibility that not everyone has to get the tasting menu. 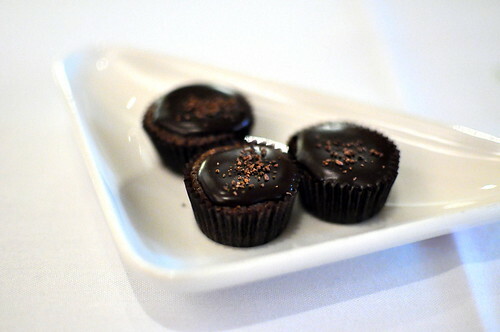 I wish they’d develop a dessert tasting menu since I love Karen’s desserts! those espresso dark chocolate brownies look super dense. yet super awesome. but mexican chocolate shake…. mmmm i love when a dessert comes with a mini drink. 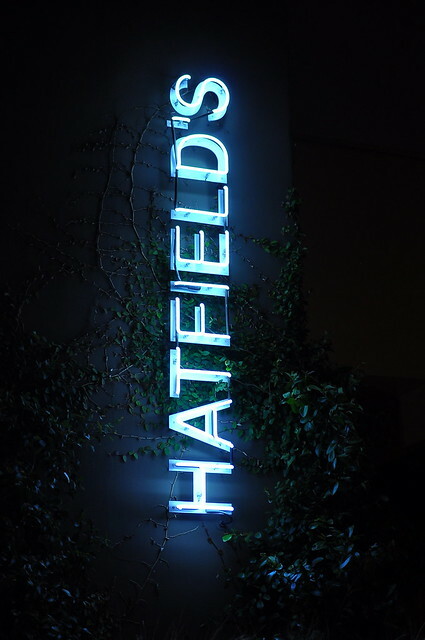 Hatfields is THE place I want to visit in 2011! Strangely, I thought I saw you and the astronomer on Master Chef in the Hatfields episode. Or was that just me?